MT BeJewelry is an responsive magento theme 2015 design by Elite Author of themeforest. MT BeJewelry consists many interesting features that will find it so suitable for every kind of Online Store, such as Sport, Jewelry, Clothes, Shoes and so on. Control the look of every aspect of your store. Extensive theme editor lets you control the colour style fonts etc. Responds to the screen resolution, works on all desktop and mobile devices. “New” and “Sale” on product page, in categories and on other product listings (editable from admin panel). Brand logo on product page. Customizable image size on product page. Simple and clean responsive eCommerce Theme. 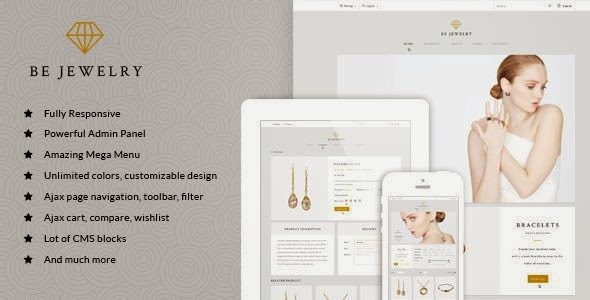 Item Reviewed: MT BeJewelry Multipurpose Responsive Magento Theme 2015 9 out of 10 based on 10 ratings. 9 user reviews.